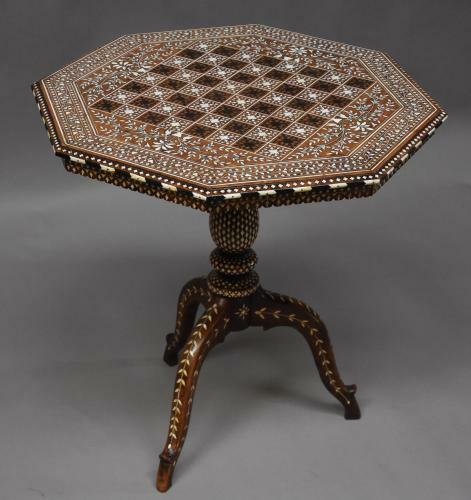 This table consists of an octagonal top with a central chess or games board design with inlaid ivory and ebony decoration surrounded by four panels each inlaid with a central urn with bird and trailing foliate decoration. The outer panels being inlaid with scrolling foliate decoration leading down to a moulded border with inlaid quatrefoil decoration, a chevron design and a shaped freize below. The table is supported by an elegant turned and inlaid column terminating on an inlaid tripod base. Ths table is in very good condition for age, is of stable construction and can go straight into a home.